Huge thanks again to Karim at JetNews for not only using us on the cover of their 5th Anniversary issue, but for covering two of our events. Below is an article written by Ludo of Fullgaz.com about our win in France at the first stop of the World Tour. Huge thanks to JetNews for using us on the cover of their 5th Anniversary issue and for running the story that Ludo from Fullgaz.com did on Pierre and My trip to Australia. Thanks to Daniel from DP Productionsfor sending us this cool article from an adventure magazine in Argentina. Great high quality power sports magazine out of Argentina ran a story on our trip to Argentina in their current issue. Cool little power sports publication out of Canada did an interview with me for this month's issue. Huge thanks to Chris Burgess from the Nascency Project for writing this article on the O-side crew. This is by far my favorite article. Thanks to Chris and PWI for running the article. Also I included an add that PWI ran for my blog...just thought the pics was cool so I included it here. Thanks to the guys at PWI for running a cool article on our trip in Australia wrtten by Ludo in the July 09 issue of PWI. Thanks so much to Andy (aka Jet Man) for sending us the article he wrote for the latest issue of Jetskier and PW in the UK! Thanks so much to Jet News for using us on their June/July 09 cover! Keep an eye here for the complete article when I get my hands on it. Thanks to HydroJet our of France for covering out Australia contest in their April/May 09 issue. One small pic in the latest Quad Passion Magazine from France. Thought I would post it becuase the two guys in the pic are the best riders in France. One is a friend who is here racing and dominating in the states! Good luck to Jeremie Warnia for the rest of 09! Personal Watercraft Issustrated has been covering all the freeride events around the world! We got great coverage from our trip to Argentina in the May 09 Issue! Thanks are also due to PWI for their coverage of our event in Australia in the May 09 issue as well. Thanks to Jet Skier & PW from the UK. Tim has always been great about covering our events! The May 09 issue has some great shots from our trip to Australia! Thanks to Ride Magazine for giving us a little coverage in their March/April 2009 Issue. We showed up in the index page and have a few small pics in the Daytona Freeride Article. PWI has been great about covering our surf events lately! But I think the March/April issue can safely be called the "Surf Issue" for this year. We got good coverage from the index page to an ad for PWI's web content, and in four stories in between. This issues covers our Rapids Trip, Blowsion Beach Party, JK Freeride in Pismo, and The Nellscottt Tow Classic surf event in Oregon. JetWaves magazine from France has just launched a free version of the magazine on thier webiste. Same as the print version, just easier for the international crowd to get and see. www.JetWaves.Fr They gave us great exposure in their Dec/Jan issue. Below is an article from our trip to Morocco. Spainis magazine H20 Passion ran a huge article on the final stop of the IWA World Tour from Brazil in their 8th issue this year! PWI was nice enough to run the article on Goldeneye Resort in Jamaica in their December/Jan issue! Truly my favorite place in the world! December/Jan issue of PWI also carried a great article from the last stop of the IFWA World Tour where we were able to clench our first World Championship! PWI has been great to us lately! The October/November issue has a feature on our trip to Morocco! The caption on the two page spread says it's Pierre...but it's us! Thank you very mcuh to Jet Pulsion out of France. They were nice enough to feature our win in Montalivet France earlier this year in their 8th issue! Jetnews Magazine from France gave us great coverage from Brazil in their 29th issue! Thanks again to FunJet Magazine from France for running a tremendous artilce on Goldeneye Resort in Jamaica, in their 71st issue of the magazine. UK's number one water craft magazine JetSkier & PW ran a fantastic article on the Brazil stop of the IFWA World Tour! Tim, thanks for the center fold! FunJet issue #71 from France has run a great article on Brazil! Thanks guys so much for the coverage! Thanks to JetSkier & PW from the UK for running a great article featuring us and Goldeneye Resort in Jamaica! H20 Passion is the number one PWC magazine in Spain and in Portugal! They gave the cover shot, ran a huge story on Morocco, used us in a free ride article, and featured us in an interview section! Thank you very much H20 Passion! I think I like their new nick name for me "The Crazy Flying Man!" Fun Jet (French) Magazine ran a terrific article on the Montalivet stop of the IFWA World Tour, and gave us tons of coverage! The July/August Issue of the French magazine Jet Waves ran an article on the IFWA stop in Zarautz, Spain. We got a couple small pics. Jet Skier & PW out of the UK has been nice enough to run an incredible article on our trip to Morocco in their August issue. Thanks to PWI for great coverage of the European leg of the IFWA World Tour in the August issue! Thanks to WaterCraft World for running a 5 page article on Morocco and contests in France and Spain! They also gave us a shot on the table of contents. Great coverage of our Spanish stop of the IFWA world Tour in the July issue of Jet Skier UK! We got a couple of good pics on the last two pages. June issue of PWI ran our test of the Yamaha WaveRunners in the Everglades. Jet Skier UK ran a great build article on our new GoFast Ski! Check it out in the June issue! June issue of Jet Skier UK, couple of pics form the first round of the IFWA World Tour! Made the cover of the May issue of the French HydroJet Magazine! We also have some good shots inside from the first round of the IFWA World Tour, "Jet Jump Extreme" held in Montalivet, France. We got some great coverage in the May/June issue of the French magazine JetWaves! Pic on the third page of the Daytona Freeride article from the May issue of Ride Magazine. Thanks Pete for letting me ride your boat there! May issue of Jet Skier UK small pic of Mike Serlin and my new GoFast boat on the bottom left of the page! April issue of Jetskier UK I got a couple shots from a test of the 08 Yamaha Wave Runners we did with Scott Watking, Taylor Curtis, Mike Serlin, and Arno Olbright. 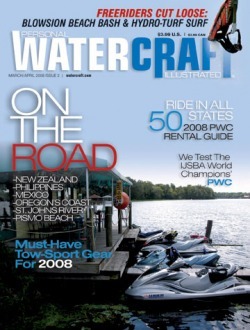 Cover of the March/April issue of Personal WaterCraft Illustrated, we should have some good shots inside as well! Check out the March/April issue of Jet Waves magazine from France for a 4 page spread and interview!